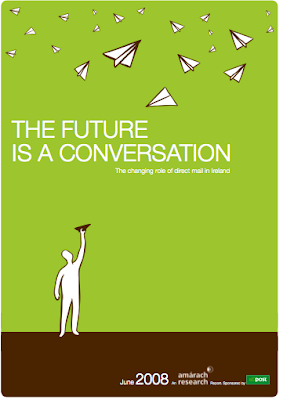 Amarach have published "The Future is a Conversation", a 20-page report on the changing role of direct mail in Ireland. There are some interesting bits in it. For example, they believe younger people are receptive to direct mail and "receiving something personally addressed to you in the post is something of a novelty for the bebo generation". I'd admit I was a bit sceptical when I saw the report was sponsored by An Post but they don't pretend that the trends are all good. One stat they share claims that only 14% feel 'positive' or 'very positive' about direct mail. Thanks Kevin for sending on. You can download here.